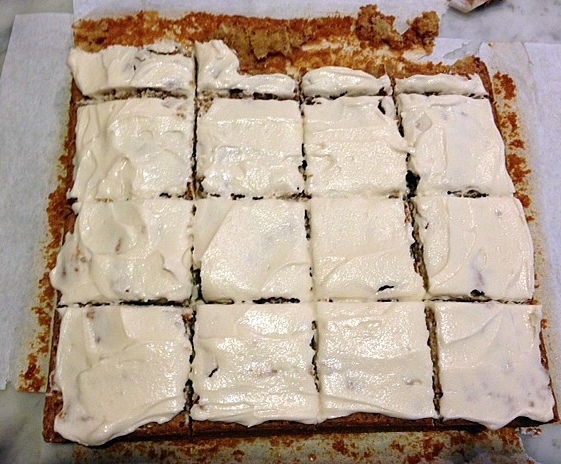 A Cake Bakes in Brooklyn: Why Are These Called Jewish Cookies? I recently bought a binder full of hand-written recipes from someone in Texas and was intrigued by a recipe called "Jewish Cookies" (which appears right across the page from a Christmas cookie recipe). So I made them. And I still can't figure out what makes them Jewish. A friend offered one explanation: These cookies were made by one of the few Jews in a small Texas town, and were so identified by others based on the religion of the cookie baker. Well, that sounds as plausible as anything else. 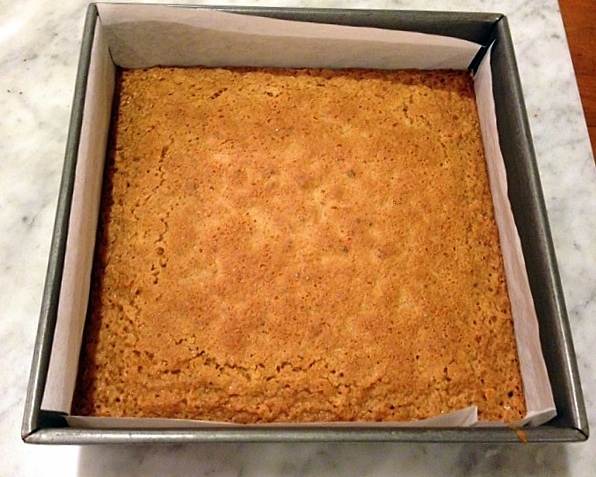 I lined the pan with parchment, so as to create a sling with which to remove the entire cake after baking. These still stuck to the paper -- next time I'd also grease the paper. 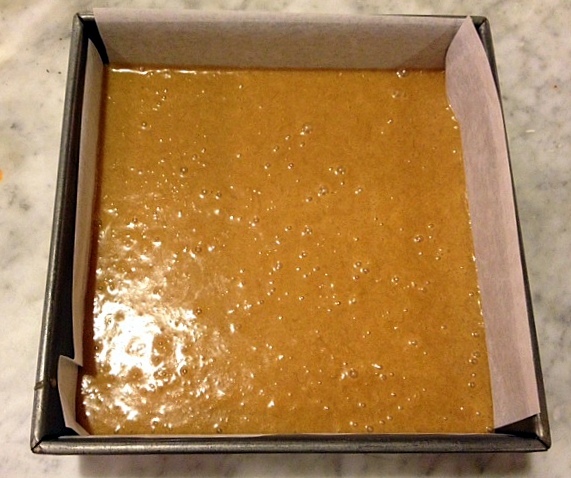 Frost first, then cut into squares. Recipe below, and below that is the method I used. Grease and flour an 8 x 8 inch pan. Beat eggs. Add brown sugar and combine. Add in flour and salt. When combined, add coconut and vanilla. Mix well and pour into prepared pan. Bake about 30 minutes. Beat butter. Mix in sugar and vanilla. Add cream until it is of spreading consistency and cover cake. This is very weird, Susan. I was just going through a cookbook (within the last three weeks) from Texas as my mother in law is Texan. My husband converted. 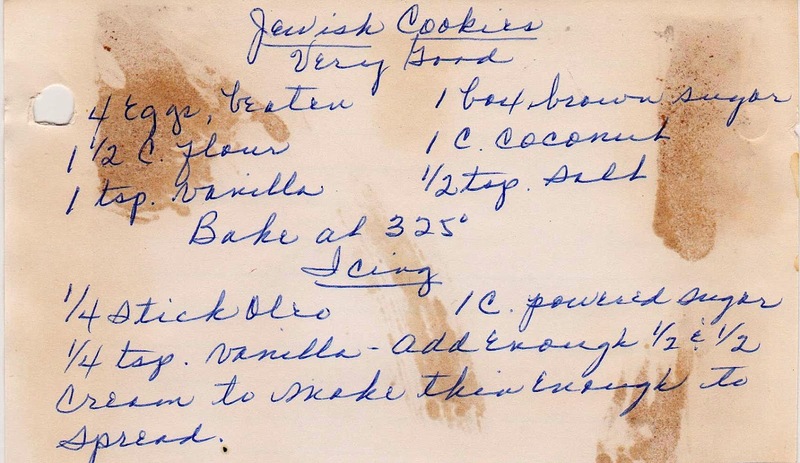 In that cookbook, I also saw a recipe for Jewish cookies. This was a church cookbook, I believe. I'll compare the ingredients and let you know, but I thought it quite bizarre. Maybe there's a genre of Texan Jewish cookies! 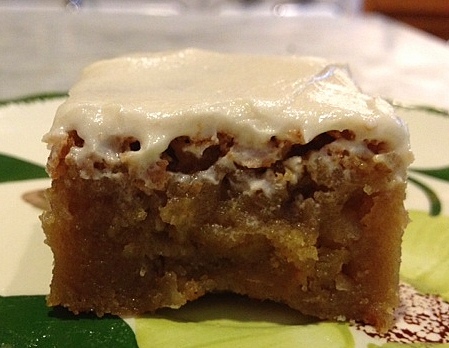 It looks very moist.....probably all that brown sugar. Would you mind sharing info about buying recipe collections? I looked on line and can't find a thing about how or where. I love your blog and my daughter-in-law does also. We both love to bake. Sure thing, Barb. I used to buy them at estate sales and vintage stores, mostly in Ohio, but they are getting harder to find. So now, I buy them mostly on eBay (searching under handwritten recipes). The disadvantage is I can't really see the recipes prior to purchase, but the advantage is I now have recipes from all over the country! Thank you Susan I appreciate the information. Susan, Thanks for posting this. I stumbled across your blog while searching for "Jewish Cookies" (trying to find an old recipe by the same name that we got from a church friend in the 1970s in Spring, TX), and the basic ingredients and proportions of flour, eggs, and brown sugar are the same (or very close) as the recipe you've discovered, except the recipe my family used had chopped dates and pecans instead of coconut. Raisins also work if one likes them. I also add about a teaspoon of cinnamon. The reason they are called "Jewish Cookies" is the absence of leavening (e.g. no baking soda, baking power or yeast) in keeping with the tradition of unleavened bread and baked goods during Passover. The batter still manages to rise due to the "chemistry" from the eggs and from air being trapped in the thick batter when beaten. To improve texture and done-ness, try using a larger pan (along the dimensions of a cookie sheet with sides) to make a thinner layer. To tone down oversweetness, one might skip the icing (I usually do), and/or experiment with the ratio of sugar to flour.